The weather is cooling down, school is back in session and it is finally starting to feel like fall. Bring the fall spirit into your house by making these colorful autumn crafts with your little ones. One of the best parts of this season is watching the leaves turn brilliant shades of red and gold. Create your own art from autumn leaves by making simple rubbings. Take out two pieces of plain white paper and arrange a few leaves of different shapes, vein side up, on one sheet of paper. Place the second sheet on top of the leaves. Pick out several brightly colored crayons and take off their paper wrappers. 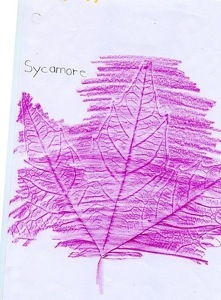 Turn the crayons horizontally and rub across the top sheet of paper, revealing the leaf images in detail. Repeat with different leaf and color combinations for unique works of art. Hang these beautiful faux stained glass crafts in a window where they will catch the sunlight. Take a sheet of contact paper (clear laminated paper) and peel half of the backing away, being careful not to get it stuck to anything. Tear small pieces of colored tissue paper and overlap them on the sticky part of the contact paper. Go wild with the shapes and color combinations! Peel back the rest of the backing and carefully fold the contact paper over the colored tissue paper so you both sides are laminated. Smooth over air bubbles. Fold a piece of black or colored construction paper in half and trace and cut out a leaf shape (this will give you two leaves). Cut the middle of each leaf out, leaving a small border. Trim the contact paper so it is in the same shape as your construction paper leaves but slightly smaller. Glue the construction paper on each side of your contact paper leaf, forming a frame. Get ready for Halloween early by making these fun and funky skeleton crafts. Take a paper plate or piece of colored construction paper and arrange different kinds of dry pasta (macaroni, penne, shells, spaghetti, etc. ), as well as dry lima beans in the shape of a skeleton. Glue each bean and piece of pasta to the plate or piece of paper and add details with crayons, markers or colored pencils. What are your favorite autumn crafts? Leave your suggestions in the comments! Previous: Previous post: September is Library Card Sign-up Month!